Email isn't very good at expressing urgency, so if you need a place to live, you're not going to want to wait around for someone to check his email. Enter AOL Instant Messenger via DSAim or MSN Messsenger with Beup; just log on and start harassing your local friends for a spare couch or living room floor. It's so much easier to ignore pleas for help when they're not being made in real-time, and scratching out "help i am on a ds and i cant type very fast" might just yank the heartstrings just right. Anyway, it's worth a shot. The MSN client actually supports PictoChat-style scribbled messages, so you could even draw a little picture of you with a big frowny face getting harassed by the police to accentuate the importance of the situation. 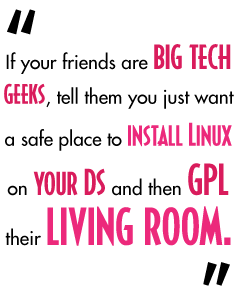 Or if your friends are big tech geeks, tell them you just want a safe place to install Linux on your DS and then GPL their living room. But taking care of basic needs wasn't enough for me, so I decided to take care of a little future planning, courtesy of DSLiveWeather, to check the weather, and Treasures of Gaia to familiarize myself with my surroundings via Google Maps. Probably the coolest application to hit the DS, though, is SvSIP, which lets you make voice over IP phone calls - that's right, phone calls, though you need to bring your own provider - with the DS' built-in microphone. While it's not quite a replacement for a cell phone, it'll do in a pinch, and besides, the DS-homeless can't be picky. On the plus side, having an extended conversation with your DS probably looks about as bizarre as yelling "OBJECTION!" at it, so you won't stand out too badly. And if the police come by this time, they'll probably be more interested in how you got your DS to do all that than what you happen to be doing at the moment. Make no mistake - this is not sustainable. Your friends will get tired of you sleeping on their floors, your work (and your editor!) will suffer if you have to type long pieces with the touch screen, and your relationships - well, seeing a grown man whispering tenderly to his DS Lite that he loves her very much is not a pretty sight. I managed with the DS until I could find an apartment, and then a park bench nearby that got perfect Wi-Fi access, provided the kids weren't out playing baseball, or that weird cram school kid didn't come by at 2:00 a.m. and ask me if there were any police nearby. But with a little ingenuity, it's doable, and hell, it makes for a decent story when it's all over. Just think about paying your karmic debt back, when it's winter and you've got the broadband connection over your wireless router in your own apartment, under the comfort of your own blankets; maybe you might want to leave your access point open every now and then, in the off chance it could help some other unfortunate soul. Pat Miller has been doing this for way too long. Stop by his blog, Token Minorities, for more on race and videogames.